A wide variety of wastes are generated during construction projects which may be classified into four categories – excavated wastes, demolition wastes, construction wastes and mixed wastes. Construction wastes are also known Construction and Demolition (C&D) wastes. Excavated materials is made up of soil, sand, gravel, rock, asphalt, etc. while demolition wastes is comprised by concrete, metal, roofing sheets, asbestos, brick, briquette, stone gypsum, wood material. Waste materials generated from construction activities are concrete, dry wall, plastics, ceramics tiles, metals, paper, cardboards, plastics, glass etc. In addition, mixed wastes, such as trash and organic wastes, are also produced in construction projects. Almost 90 percent of construction wastes are inert or non-hazardous, and can be reused, reclaimed and recycled and reused. The non-recyclable, non-hazardous and hazardous waste materials constitute the remaining 10 percent. The non-inert materials include trees, green vegetation, trash and other organic materials while and the hazardous construction waste materials include contaminated soil, left over paints, solvent, aerosol cans, asbestos, paint thinners, striping paint, contaminated empty containers. Sustainable management of construction wastes uses number of strategies and is based on the typical waste hierarchy: Avoid/ eliminate, reduce, reuse, recycle, treat and dispose. Avoidance or source reduction is considered as the best strategy for waste management and is the most economic way to reduce waste and minimise the environmental impacts of construction wastes. This can be done by avoiding use of hazardous materials such as asbestos-containing materials or chromated copper arsenate treated timber or through green purchasing of materials. This includes purchasing of non-toxic materials, pre-cut timbers and ordering materials of desired dimensions. Although source reduction and elimination are preferred options in the waste management hierarchy, it is always not possible to do so. In this case consider reuse, donation and salvage options to companies or people who need those. Reuse option lengthens the life of a material. Reuse strategy can be used in two ways. Building Reuse – It includes reusing materials from existing buildings and maintaining certain percentages of building structural and non-structural elements such as interior walls, doors floor covering and ceilings. Material Reuse – This is one of the most effective strategies for minimising environmental impacts which can be done by salvaging, refurbishing and reusing materials within the same building or in another building. Many of the exterior and interior materials can be recovered from existing buildings and reused in new ones. Such materials will include steel, walls, floor coverings, concrete, beams and posts, door frames, cabinetry and furniture, brick, and decorative items. Reuse of materials and products will help to reduce the demand for virgin materials and reduce wastes. There is very good potential to recycle many elements of construction waste. Recycling involves collecting, reprocessing and/ or recovering certain waste materials to make new materials or products. Often roll-off containers are used to transport the waste. Rubble can be crushed and reused in construction projects. Waste wood can also be recovered and recycled. Many construction waste materials that are still usable can be donated to non-profit organizations. This keeps the material out of the landfill and supports a good cause. This option should be considered after all other options are exhausted. The disposal of construction materials should be carried out in appropriate manner through an approved contractor. 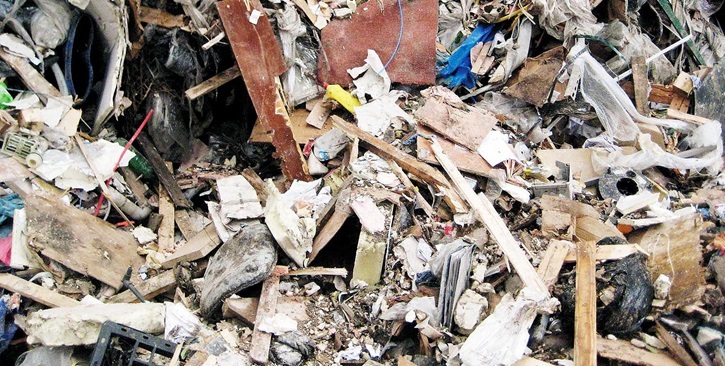 For examples, certain components of construction waste such as plasterboard are hazardous once landfilled. Plasterboard is broken down in landfill conditions releasing hydrogen sulfide, a toxic gas. Tagged Asbestos, C&D Wastes, Construction, Construction Wastes, Construction Wastes Management, Demolition Wastes, Hazardous, Recycling, Reuse of Construction Waste, Source Reduction, Wastes, Wood. Bookmark the permalink.